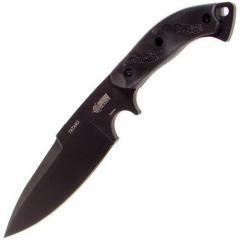 have many fixed blade knives to choose from. The Blackhawk Tatang is a fearsome fixed blade knife inspired by the traditional Filipino barong sword. Its broad, tip-heavy shape gives it exceptional chopping power and reach, and the sharpened false edge enhances its penetrating capabilities while also allowing the use of deadly backcut techniques. The integral subhilt allows the user to choke up on the blade for greater fine control. A black epoxy coating protects the steel from wear, and also prevents reflections for stealthier nighttime use. The pistol grip handle includes a lanyard hole and comes with a thermoplastic rubber overlay with textured panels to provide a secure grip. The included reinforced ballistic nylon sheath makes the knife easy to carry and protects it while not in use.